Mountain cottage with restaurant (50 places). Total capacity 25 beds, terrace, cycling tracks, Ore Mountains Artery … More » . Possibility to provide celebrations, weddings, trainings, etc. 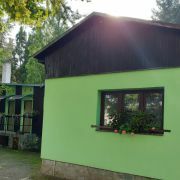 The database contains direct contacts to owners of accommodation in Teplice. Reservations are passed without any middleman and commission!